Hello and welcome to Handgun Radio! I’m your host Ryan Michad from the wilds of Central Maine, and this is your home for all the news, information and discussion in the handgunning world. This week, I’m joined by Weerd Beard to discuss the various handguns I saw at NRA Show 2015 in Nashville as well as some of the news from the show! How are you doing this week Weerd? Last weekend I attended the NRA Show 2015 at the Music City Center in Nashville, TN. I met a few listeners on the floor and it was great to meet you! Got to spend some time with Grant Cunningham, Paul Carlson, Richard Johnson and got to speak with Massad Ayoob several times. It was a real treat to be able to meet all these people that I looked to for knowledge while I was growing up learning about firearms. This week, Weerd and I are going to discuss some of the handguns & other firearms I got to see while I was down there. There is a great compilation video over at the Handgun Radio/Ryan Michad YouTube channel showing a bunch of the guns that I got to handle as well as some cool exhibits in the collectors corner. Many of the guns we will talk about today are in that video. Link is in the show notes. If you have not yet liked the Handgun Radio Facebook Page you are missing out on roughly 500 pictures I took while at the event. 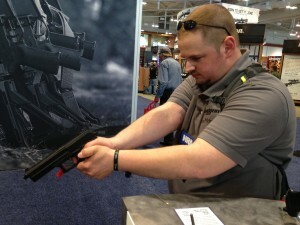 Pictures of the show floor, pictures of many guns from each side and down the sights, and much more. You DO NOT have to be signed up to facebook to view the pictures and there is a link in the show notes so be sure to check it out!!! Taurus Non-View, Curve, and TCP with Wings. Until next week, have fun & SAFE SHOOTING! !